Rock collecting is generally not a dangerous activity. But sometimes it depends on where you go. If you are looking for rocks in road cuts and railroad cuts, of course, watch out for trains and other traffic. If you are anywhere where there are rocks above you on a high cliff, remember the falling rocks and wear a hard hat! Rock hunters are injured every year by rockfall. 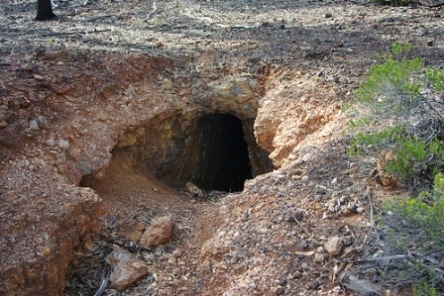 If you are on the old abandoned mine sites, don't venture into the old tunnels or anywhere where anything can collapse above you! On these sites, it is a question of when, not if, walls and ceilings collapse. Mine dumps can be good sources of rocks, but they can be unstable (loosely piled), so take care. And, when hammering rocks with your hammer, remember that pieces of rocks can be very sharp and fly fast when hammered. 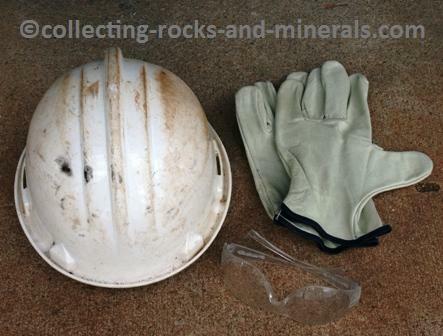 When you hammer rocks, always wear a pair of protective glasses, a hard hat, and protective gloves. It is also a good idea to wear a fluorescent vest, proper footwear that protect you from snake bites and sharp rocks; and carry a snake-bite kit. Wear clothing that suits the weather, and if it's hot, bring enough water. Consider not going alone or carrying a cell phone. Should you fall into a shaft or ravine, you will not be easy to find!